Caravan II by Carenado. 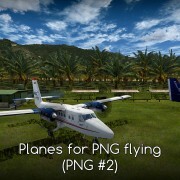 Another pretty, well-handling and slightly simplified plane from this developer. What I thing of Cessna Reims F406? I enjoy flying this plane. What I like in F406? What I do not like in Caravan II? As always with Carenado the Caravan II is pretty on the outside, good looking inside and handles well. The most experienced virtual pilots may find the default-fsx simulation of its turboprop engines too simple, but on the other hand – the performance is adjusted to the real world figures. My good opinion of this plane was not changed by some little bugs or mistakes I noticed. I recommend this plane! Please read the whole review to know what I like most and what I like less about this F406. You may ask why someone would mount a second engine on the C208 Caravan. Mainly – because of regulations. European regulations. Most of European countries prohibit single engine IFR in commercial operations. This significantly bounds the usefulness of planes like C208 or PC-12 which are restricted to flights in VMC and therefore – significantly limited by the weather. Currently some countries change their laws to allow for at least some commercial ops in single engine turboprops flying IFR. Sweden for example agrees for cargo flights. But this is current situation and the rules in the 80s were different. They forced cessna to find a solution. Partnering with Reims Aviation they build a twin engine light turboprop. Actually it is not a modified Caravan but rather the 404 Titan with small turboprop engines. And this creates a planes that somehow resembles Cessna 208, but even with the highly popular name of Caravan the 406 was never a success. I can understand why – when I fly this plane in FSX a see no logical (real world logical!) reason for such a choice. It is a more expensive to operate than the C208 and it has slightly worse runway capabilities (due to weaker retractable gear). 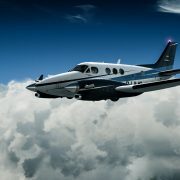 It cannot compete with King Air which boasts pressurized cabin and performs better. This is why Reims manufactured only 85 F406s and more than a third went to government agencies that may use the added safety of the second engine without bothering too much about the added costs of fuel and maintenance that are required. F406 opens vast possibilities. Almost all paved runways are long enough to land this plane and to take off in it. You can also land on grass or dirt provided the surface is not too rough. 700 mile range in not that impressive, but you will cover it relatively fast. In FSX we do not have to consider every dollar spent on gas (or jet fuel in this situation) so the cost of fuel will not be limiting for you. You do not have to wear the oxygen mask when flying in front of your PC so you may try to use the high altitude capabilities of this plane (it is certified for flights up to 30,000ft). Oxygen system is not simulated in this plane – the oxygen gauge shows full tank all the time. Ok, let’s move to technical description of Carenado’s product and to my impressions. Carenado offers a passenger version of Cessna Reims F406 with or without the cargo pod (selectable in 2d panel). It comes in several liveries – including some US and European (for example the Greek Coast Guard). There are also a few 3rd party liveries available on the web (like the DHL by Ron Attwood which I use often – available on Avsim). Carenado always provides a limited selection of documents that are useful but leave me with doubts and questions. The main document that is missing is… the manual. Unfortunately there is nothing that would explain how the systems work and why we have to do some of the tasks mentioned in the checklists. There is also no panel description or instruments layout so the pilot needs to figure the position of each switch by himself. What is included – checklists for both normal and emergency procedures, avionics guides and performance tables. Apart from the emergency procedures (which are of little use in aircraft that does not simulate failures) these documents are usefull. I like the performance tables which are matched closely by the flight model. With them I can create the flight plan and calculate fuel precisely. One more issue I have with the checklists – they come in the form of image scans – the text search does not work with them. Standard Carenado installer which requires the product key. All manuals are stored in Carenado folder inside the main FSX folder. People who own Flight1 or RealityXP GPS can switch the interior model to one fitting their equipment with the installer-configurator provided. You will find the installer files in FSX\SimObjects\Airplanes\Carenado F406_Caravan_II (FSX – the main FSX folder). If you have ever flown Carenado plane – you will not be surprised. It is a good looking plane and flying it is a pleasure. If I was to compare it to previous Carenado planes I had – it is the best! It looks great, performs correctly and (if compared with older products) simply works better (in terms of ergonomics, systems, bugs). For those who are new to Carenado. This is one of the leading developers in terms of aircraft design, modelling and texturing. You can also expect avionics that are improved when compared to default FSX planes (and in this case – when compared to older products by Carenado). Some systems were left at the “fsx-default” level. Unfortunately (for those who like the full experience) the engines also use the default-fsx logic that is incorrect. Oh, they are good! And when I look at this F406 I feel that they are getting better with every plane they release. From the outside the plane is perfect – the model is detailed and the textures – superb. Inside you will find a detailed cabin and cockpit featuring each and every switch, button and fuse (fuses are not animated). Using the same menu you can open (or close) door (pilot’s and cabin), open baggage compartments and add or remove cargo pod. The plane is equally good on the inside. Carenado finally got the overly sharp textures right and now I can not find a single reason to complain here. Just look at the picture above and check this fuse panel – fuses are modeled and textures show their amperage in clear and readable text. Other text markings, notices and warnings are also easily readable. The inside of the cockpit shows the 10 or 20 year wear on some parts – you will see scratches, damage and dist in places where you could expect them. The high quality of the cabin surprised me. Usually the resolution of mostly unseen parts of the plane is lower. In this F406 you can read warning notices next the the rearmost seats. The plane is equipped with digital PFD and advanced EHSI based on Aspen Avionics EFD1000 system. Apart of a few ergonomic issues I have with knobs, it makes a great impression and makes flying this plane much easier (due to better situation awareness). GPS. F406 panel holds two GNS 530 units. It is the standard fsGPS packed in a new 3d model. Unfortunately it does not have the same features as Carenado’s custom G1000 – where you can edit your flight plan. Basically – you will use this GPS just like you would use this device in any other plane in FSX. You can change these two GPS units for Flight1 GNS or RealityXP system (payware – you need to buy them separately). The weather radar works similarly to other weather radars in FSX add-on planes (with the exception of PMDG). Its readings will be often incorrect. I do not care for this too much as it is the FSX limitation that most developers do not try to overcome. Still – it’s a nice toy and I am glad that it works even partly. The autopilot has two sides. The good and the ugly. Carenado correctly (or mostly correctly) programmed AP modes like alt hold, alt arm, vs. This is something that I love about this plane (mostly because I can not stand the default fsx AP logic in most of payware planes). On the other hand – this AP will crash your plane if it looses nav signal (when flying in nav mode). Of course – you can react and prevent the increasing bank which occurs when guiding signal is lost but… you should not have to. You will not see this effect in most of your vor-to-vor flights. Nor will it affect your approaches. Simply – keep it in mind. I use HDG mode when I suspect that the nav signal can be lost. The correct behavior would be to switch to roll (wings level) or HDG hold mode when the nav signal is lost. Turboprop engines are terribly simulated in FSX and I know only 3 or 4 planes which developers went around the problem and created the correct engine logic. This is not one of these planes and basically – you can treat this engines like normal pistons with a little lag when the power is applied. In F406 Carenado partly solved feathering problems I noticed in their Beech 1900. F406 does feather the prop and feathered prop will create less drag than windmilling. The only issue is with the prop lever – you cannot move it into the feather range with your mouse (or controller axis). Instead you need to use a propeller speed decrease keyboard shortcut to move the lever to correct position. Fortunately – it is no longer necessary (as it was in B1900) – the prop will feather when the lever is in the lowermost position in which it can be set with mouse or axis. Convenient. I can live with slightly incorrect position as long as the effect of my action is correct. What I like in this engine is how the performance was adjusted carefully to the real world specs. In my opinion Carenado was always paying attention to the numbers but this result was still a little surprising. In my tests I found that the difference between published power settings and the speed or fuel consumption was always in the range between 3% and 14% of the published value*. 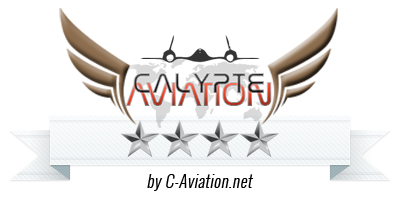 It is an outstanding result in FSX world. And I have to admit that values like 3%, 4% and 5% were more common than larger errors. *- it usually means that for given power settings the speed was a little higher or the fuel consumption was a little lower than published. The first impression is “why it does not rotate”. Only after the first take-off I checked the manual and noticed that Vr is 95 knots in this plane – much higher than the stall speed with full flaps. I noticed some pulling and uneven thrust of F406’s two engines on take-off. I like this – it is so different from all these planes that feel like they were moving on rails. Unfortunately – the “flying on rails” stability can be noticed once airborne. I understand that F406 is a stable plane but I wish it was a little less stable. It may be considered a little too easy if the pilot is used to the most demanding add-ons. On the first few landings I noticed that the reversed thrust seems less powerful than on similar planes I flown in FSX. I can not confirm if it is correct or incorrect. What I could confirm is that reverses and brakes give the F406 a correct (or mostly correct) landing distance. This was the most important for me and I am quite satisfied with F406. As always in Carenado – I had some trouble clicking several switches and I find switch logic inconsistent. The bright side of ergonomics – there are 2d panels for main displays (PFD and EHSI), autopilot and GPS. I mostly used the autopilot 2d panel. The actual device is located on the pedestal column – in an inconvenient place for the real world pilot and in terrible place for virtual pilot. As always (!!!) Carenado left several small bugs. Again I feel that no one in Carenado tried following the checklist and casually flying this plane for some time. Even on startup you can notice that there are lamps for armed fire extinguishers. The right does not work. Cutout switches for both engines arm the left-engine fire extinguisher… This is small stuff but it irritates me every time I find such a problem. This plane contains some high resolution textures that may have an impact on a slower system. I did not notice anything that would be worth mentioning. As always with planes by Carenado the Caravan II is pretty on the outside, good looking inside and it handles well. The most experienced virtual pilots may find the default-fsx simulation of its turboprop engines a little too simple but on the other hand – the performance is adjusted to the real world figures. My good opinion of this plane was not changed by some little bugs or mistakes I noticed. I recommend this plane!. F406 has a price tag of $37,95. Cheaper than some general aviation planes, a bit more expensive than others. I consider it a standard price for a standard product I can recommend. If you are looking for a nice general aviation turboprop – I would consider this one at this price.